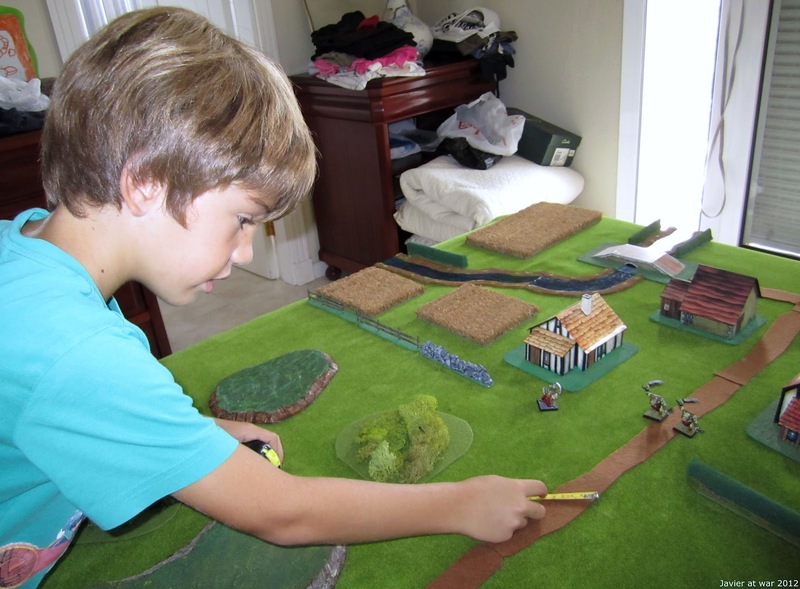 Today we finally played a long promised game to my 8 years old son. 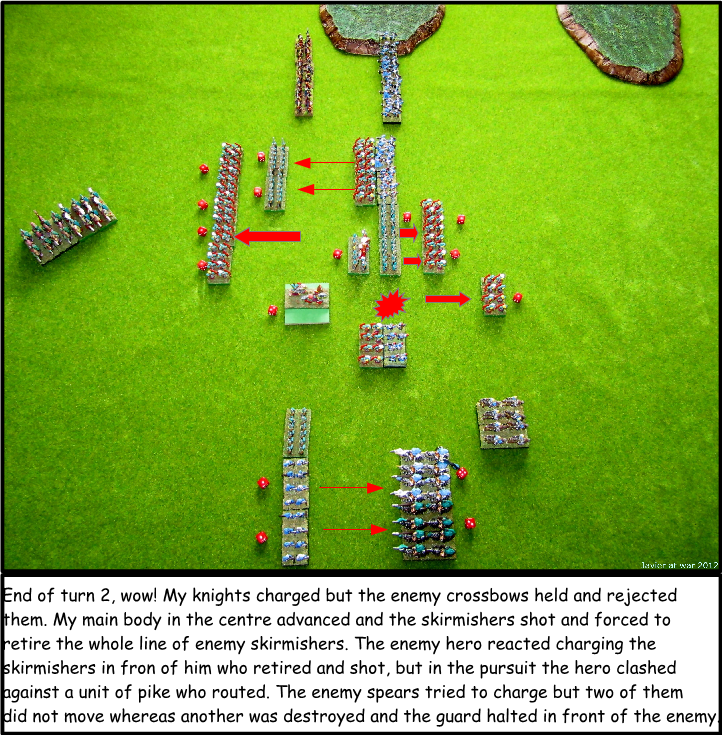 He had finished painting his second miniature, a plastic Dwarf f from the Skull Pass, and wanted to test it on the battlefield. 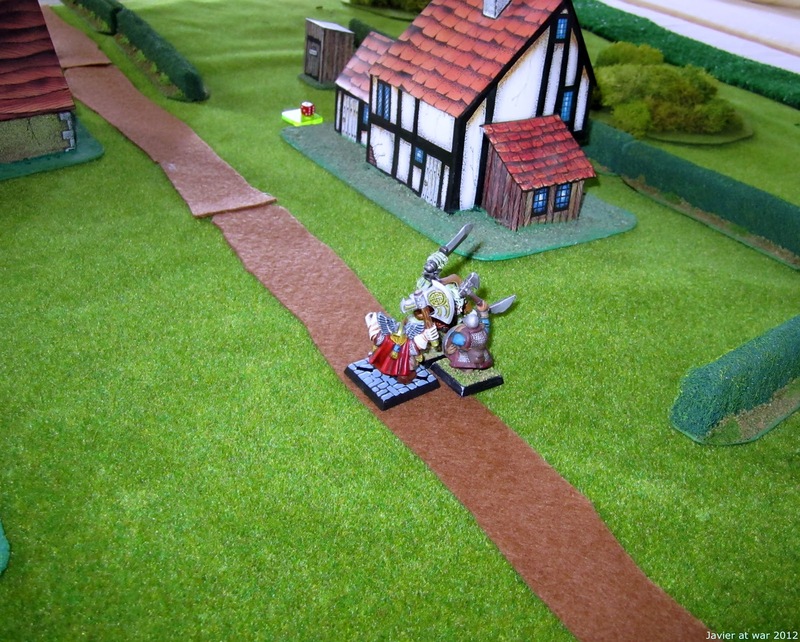 He also wanted to kill some Orcs, so I grabbed another Dwarf and quickly set up a game of WHAA from THW which is perfect to introduce somebody to wargaming as it can be played cooperatively. Esta mañana finalmente jugué con mi hijo de 8 años una partida que le tenía prometida desde hacía tiempo. Acababa de terminar su segunda mini, un enano de la caja del Paso de la Calavera, y quería probarlo. 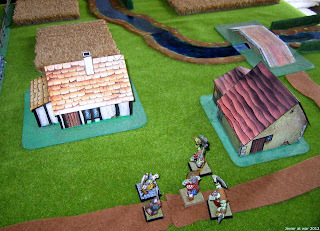 También quería matar unos cuantos Orcos así que me pillé un enano y rápidamente preparé una partida de WHAA de THW que es perfecto para introducir a alguien en el mundo del wargame ya que se puede jugar cooperativamente. He soon mastered the ruler. Enseguida le cogió el truco a la cinta métrica. So we were two Dwarfs, me Rep 5, AC 5, 2H Axe, 2 throwing axes, and my Son's Rep 4, AC 5 + shield, axe and two throwing axes, who were walking by the road to a village which had been raided by some evil Orcs. Así que eramos dos enanos que iban por la carretera camino de un aldea atacada por los orcos. It was his first game and in the beginning he was a bit shy and afraid of being killed so I stepped forward and killed the first two Orcs. He participated in the melee against the third one but I killed it as well. In that moment he was a bit frustrated and wanted to resolve immediately the last PEF (Possible Enemy Force counter) to kill something! Este era su primera partida y tenía miedo de que lo mataran asi que fui delante y maté a los dos primeros orcos. Luego me ayudó contra el tercero aunque también lo maté yo. Aquí ya estaba el pobre un poco frustrado y deseando matar algo. The last PEF resulted to be three Orcs to my son disappointment as he wanted to fight against one of the river Trolls I have. The three Orcs charged and I killed one with a throwing axe and another in melee. My son failed his throwing axe but could slain the Orc in hand to hand combat. His first blood! That was also the end of the game. La última PFE se transformó en tres orcos y mi hijo se quedó un poco decepcionado porque no salió ningún troll de los que tengo en la vitrina. Los tres orcos cargaron y yo maté a uno lanzandole una de las hachas arrojadizas y a otro más en melé. Mi hijo lanzó otra hacha pero falló, aunque luego mató al orco en combate cuerpo a cuerpo. ¡Su primera sangre! Esto también fue el fin de la partida. After reading some articles about Oldhammer in different blogs but especially in Diario de un Friki and Somewhere the tea is getting cold, me and my buddy felt the need to dust off his WFB rules 3erd edition and give it a try. Después de leer algunos artículos en varios blogs pero sobre todo en el de Diario de un Friki y el de Somewhere the tea is getting cold , a mí y a mi colega nos entraron ganas de desempolvar la 3ª edición de WFB y probarla. 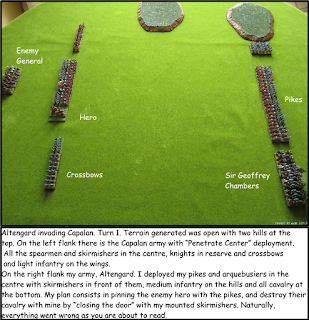 My buddy has many old school Warhammer armies but none of them painted; and me well, I sold my Orc's army from 2nd edition long ago and some things from Chaos 6th edition as well. So neither of us had fantasy armies to play Oldhammer, but then we saw the mercenary list of Norses we then decided to use our Foundry Vikings. Mi colega tiene varios ejércitos de la vieja escuela pero están sin pintar y yo lo que tenía lo vendí, así que no teníamos con que jugar hasta que nos dimos cuenta de que podíamos usar nuestros vikingos de Foundry como Norsemen. 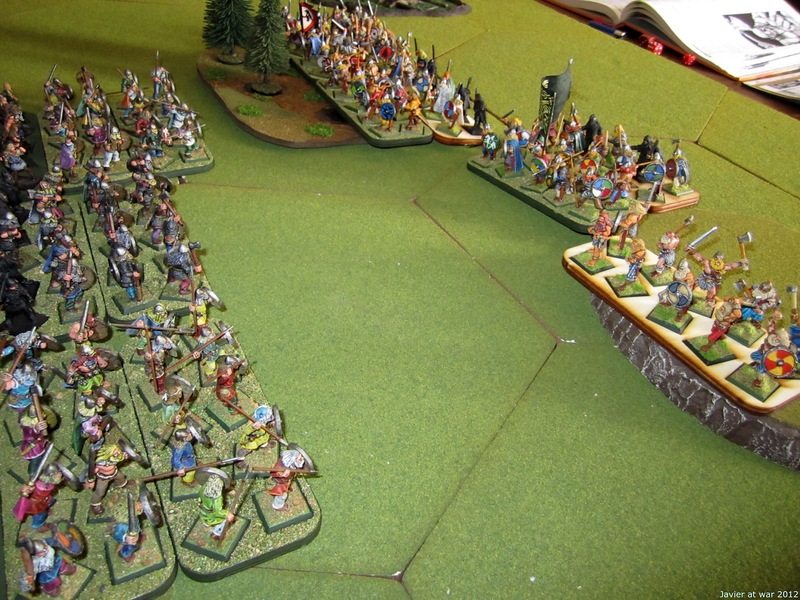 We both had enough Vikikings to field 1.000 point armies each mounted on Litko's skirmish trays. 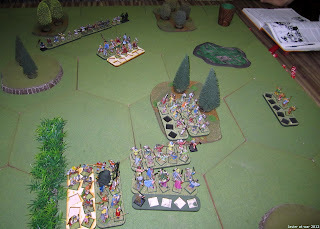 We would not be using flyers, cavalry, artillery and magic but at least we'd be using magic weapons and stardards as well as champions for the units. 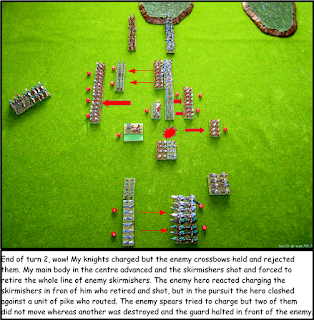 The idea behind this game was to get a taste of the ruleset and decide if it will be worth to build old school Warhammer fantasy armies once again or not. Teníamos suficientes vikingos para jugar con dos ejércitos de mil puntos cada uno. No usaríamos voladores, caballería, artillería ni magia pero al menos si usaríamos armas y estandartes mágicos así como campeones en las unidades. La idea era probar el reglamento y decidir si nos gustaba lo suficiente como para pintar un ejército de WFB. 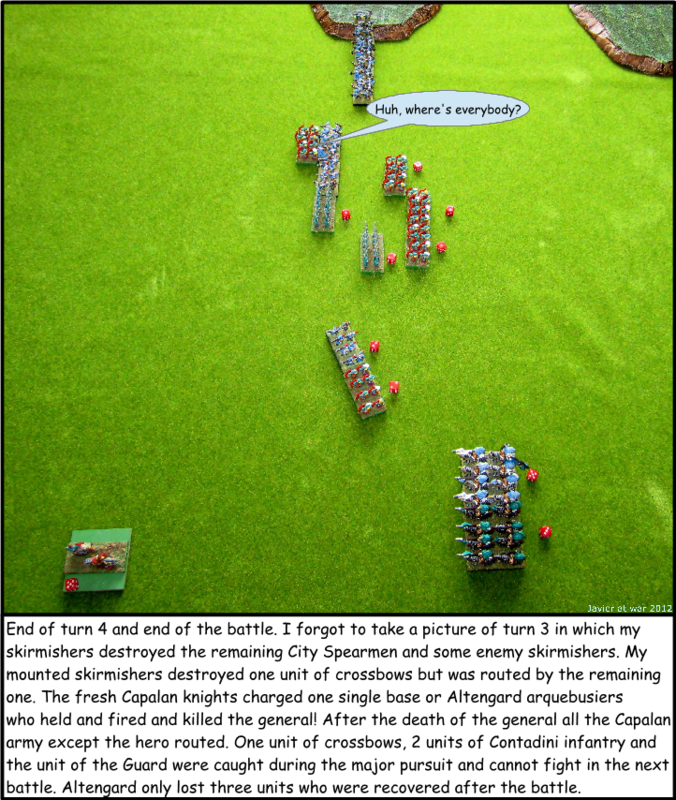 First turn of the battle. 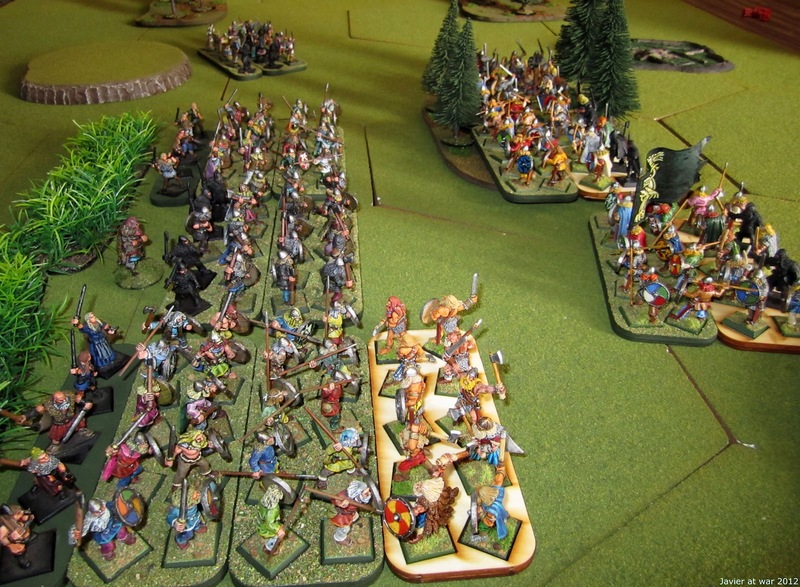 On the left three units of warriors + 1 of archers vs. three units of warriors + 1 of Berserkers on the right. Primer turno. A la izquierda 3 unidades de guerreros + 1 de arqueros y a la derecha otras 3 unidades de guerreros + 1 de Berserkers. 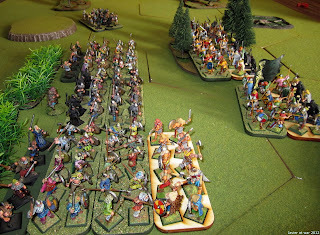 My Berserkers charge but clash against a wall of spears. 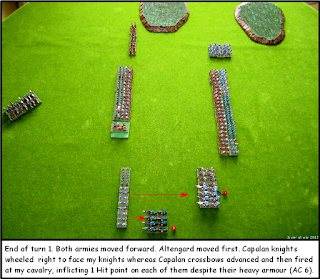 They held several turns but could not hurt seriously the enemy unit. Mis Berserkers cargaron pero el enemigo tenía lanzas y golpearon primero. Aguanté varios turnos pero no pude hacer mucho daño. My general with his magic sword Frostblade killed my buddy's general on the first round of combat. 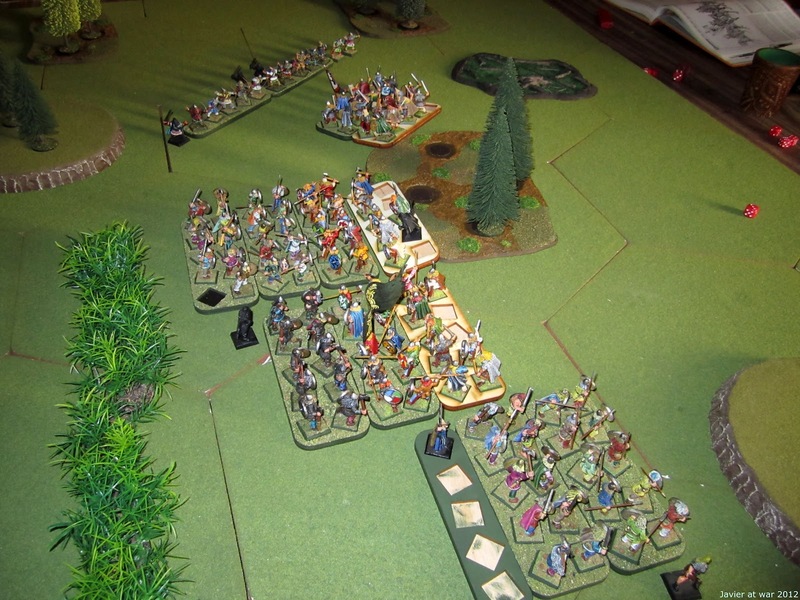 Then, he together with the Army Standard bearer destroyed the whole unit in a couple of turns! Mi general mató al general de mi colega de un solo golpe con su espada Frostblade. Luego, junto con el estandarte del ejército, masacró a la unidad enemiga en un par de turnos. 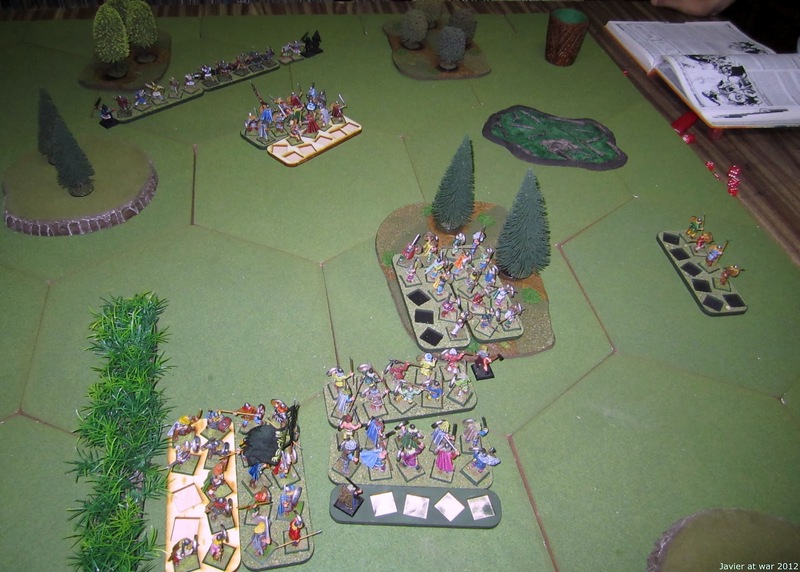 My buddy's archers were shooting during all the game at my Huscarls (Norse warriors with shield and chainmail) and finally routed them. 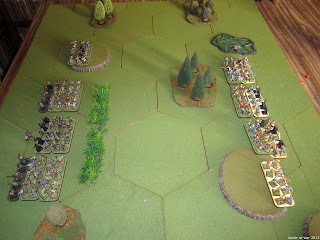 In the forest in the middle of the table another or my units without champion was also decimated and routed. 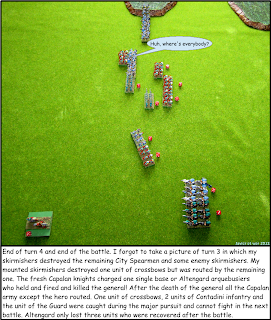 My unit with the general and standard army destroyed another enemy unit and after that we decided to finish the game. It was a mutual slaughter. Los arqueros de mi amigo estuvieron toda la partida disparando a mis Huscarls y al final los desbandaron. También se desbandó otra unidad mía que no tenía campeón. Mi general destruyó a otra unidad enemiga y después de eso decidimos dejar la partida. Había sido una masacre general por ambos lados. After the game we had a chat about if we liked or not and if we were going to play it once again. We had mixed feelings as we thought there were too many dice rolls and that magic and heroes above level 15 could unbalance the game. 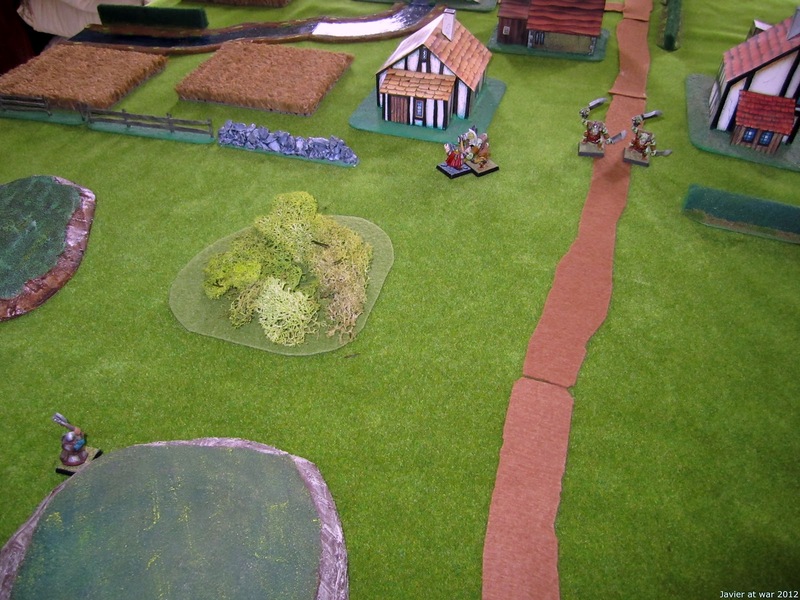 But on the other hand we also enjoyed the game quite a bit with the manoeuvres and retiring casualties from units. Naturally, we took into account the fact that we played without almost all the things that make this game fun; we felt we were playing WAB instead. We finally decided that we will leave it for the moment but maybe next year we will start to build armies to play it again. Después de la partida estuvimos charlando sobre sí volvíamos al vicio Warhammer o no. Habían cosas que nos gustaron y otras no tanto. Por un lado no nos gustó el tener que tirar tantos dados ni tampco como se pasaban algunos objetos mágicos y los héroes de nivel más de 15, pero si nos gustó maniobrar con las unidades e ir quitando las bajas una por una. 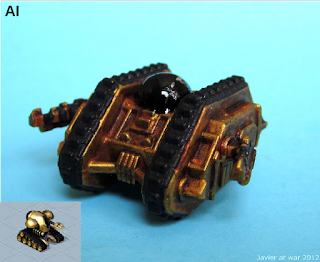 Por supuesto que tuvimos en cuenta que estabamos jugando sin casi todo lo que hace divertido al fantasy; la verdad es que parecía que jugabamos al WAB. Al final decidimos dejarlo de momento y veríamos el año que viene. I have joined a multi-player campaign using the rules Rally Round the King of Two Hour Wargames. 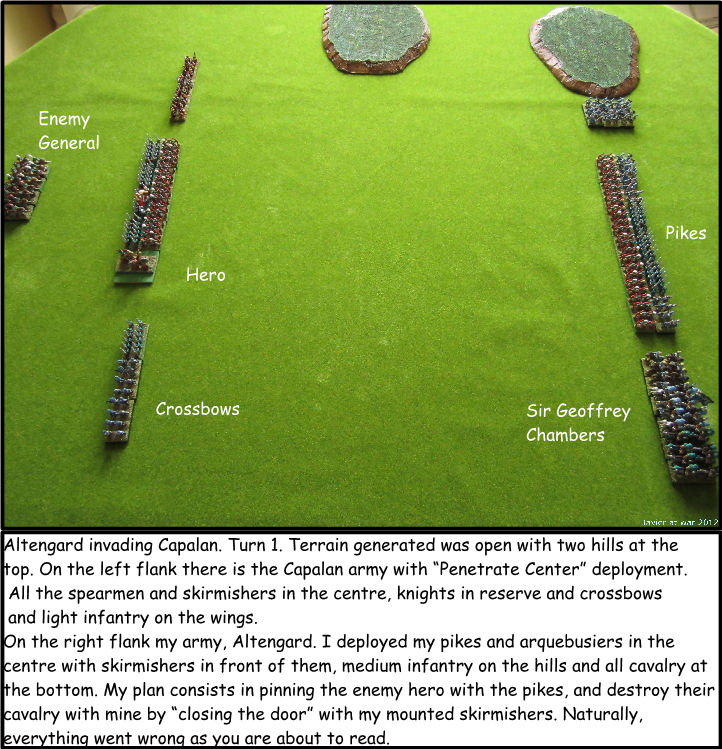 The full campaign is being developed in the blog Talomir Tales where you can find everything about it. 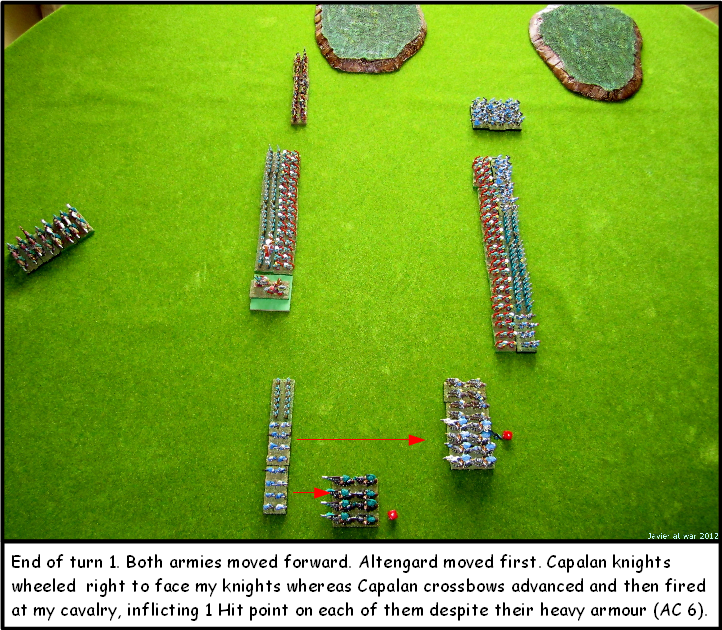 In my blog I will only publish the battles in which my nation, Altengard, is involved. Below you can see my first turn in the campaign, invading a neighbour nation. 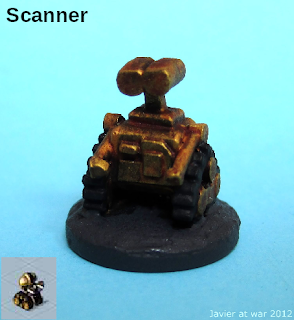 Well, after painting some marines now it is the turn of Machina. 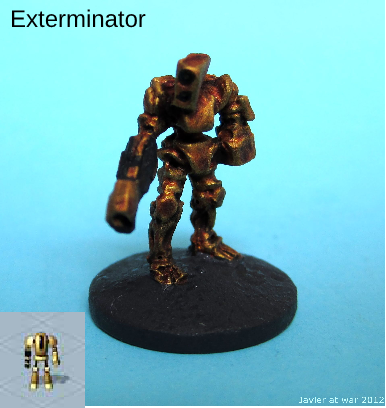 So far I have painted AI, Hunters or hair dryers, Exterminators and Scanners. I still have to paint a Missile Tank and a HQ. For the AI I converted an Epic Land Raider by simply putting half a ball on it. 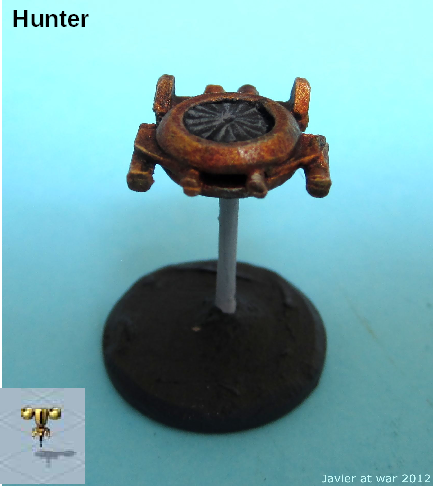 Labels: Laser Squad Nemesis 15 mm.